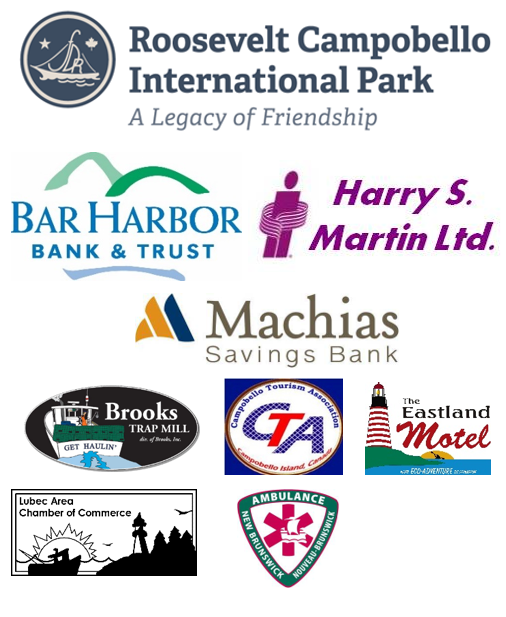 Our Half Marathon race sponsor – Roosevelt Campobello International Park – is putting on two special events for runners in addition to it’s normal programme of activities. Sunday: 5:30-9:30pm AT An Evening at the Cottage. Reservations are essential: https://fdr.simpletix.com/event-detail.aspx?ShowId=42619 (prices in Canadian Dollars). Take part in a ‘presidential’ cocktail hour at the historic Adams Lodge, featuring a short program presented by Park Interpreters on Prohibition, FDR’s love of ‘cocktail hour’, and the history of summer parties on Campobello Island while enjoying a taste of FDR’s own martini recipe (non-alcoholic options will also be provided). Guests will then enjoy an exclusive, ‘behind-the-ropes’, curated tour of Roosevelt Cottage with Park Interpreters. Following the tour, an ‘East Coast Feast’ of haddock or chicken (or a vegetarian option) will be served at Prince Cottage. Monday: 10:00am-12:00pm AT – Tea with Eleanor and the FUN Tour – Small Entry Fee. Tickets at https://fdr.simpletix.com/event-detail.aspx?ShowId=42605. A special event for marathon runners! On Monday June 24, enjoy Roosevelt Campobello International Park’s popular “Tea with Eleanor” program – a 60 minute program on the story of Eleanor Roosevelt’s life and love of Campobello accompanied by tea and cookies. Then, experience the F.U.N. Tour – the Fantastic, Unbelievable, and definitely Not-ordinary tour – which is fun, fast, and participatory, exploring the hidden secrets, scandalous stories, and tall tales of the Park and its grounds (60 minutes). Previous PostGot a Fundy Runner singlet yet? If this is your fifth year running with us please email us at info@bayoffundymarathon.com to let us know so we can be sure to have your singlet ready for you when you finish.